Best IRA Accounts. How do the best online IRA options compare? The best IRA accounts goals are to give the customer great investing options and low fees over a long-term. Right now is the best time to make your IRA contributions for the current tax season, and many of the top companies are competing for your business. The best IRA accounts for long-term growth and retirement provide the lowest fees and best investing options which allows high growth of your retirement savings account. This is generally one of the best times of the year to make a contribution to an IRA account, as many people are now receiving their tax returns which can be used towards an IRA contribution. Also, investing money into an IRA account earlier in the year gives your IRA portfolio more time to grow and compound. If you’re still in the beginning stages of planning for retirement and you’re having troubles creating a plan, or you’re unsure of your current retirement plan, check out FutureAdvisor to get a free retirement investment plan customized specifically to meet your needs and retirement goals. For the average person, the number one IRA choice is Betterment for its low fees, simplicity, and automation. It’s a great choice for anyone of any investing skill level. Betterment is also the best for online 401k rollovers. By rolling your 401k over to Betterment you’ll save money with their very low fees, but more importantly you’ll save a ton of time with their “60-Second Rollover”. An IRA account with Betterment works best for long-term retirement saving strategies, and allows you to use the “set it and forget it” method for investing, commonly known today as robo-advisors, which is ultimately the best strategy for most people and works in all market types. Some of the best places to open an IRA account are the same places you would open you would go to open an online stock brokerage account. Although, these can be great places to open an IRA account, they also need to be managed on a continuing bases. This is a great option for people who are knowledgeable about investing, enjoy actively monitoring their account, make necessary and effective adjustments to their IRA no more than once or twice a year, and are able to avoid panic, control their emotions, and human desires during market swings. Of course the majority of people can’t do all these things or don’t have the proper investment knowledge to do so. This is why in the past, before the internet, it was very common for people to hire a pricey financial advisor to manage all of their investment and retirement accounts on their behalf. Although today, some people still rely on hiring a financial advisor to manage their investments and retirement savings accounts, it’s becoming less and less common, thanks to the internet. Today it’s possible for anyone to open an IRA account with robo-advisors. They allow anyone open an IRA account within minutes from their computer or mobile device. With automated investment services no investing experience is required and little to no maintenance is required. They have extremely low fees and everything is completely automated. When you open a retirement savings account with a robo-advisor, it’ll ask you a couple of quick questions. Like your age, risk-tolerance, investing goals, and how long you plan on keeping your money invested. By answering these questions, the robo advisors are able to calculate the proper investments to place you in and will readjust your portfolio over time automatically to align with your long-term investing goals. Robo-advisors are proven to be much more effective than a human financial advisors. Financial advisors are not only extremely inconvenient, since you have to set up a meeting to begin investing with them or just to get access to your money. But generally, they also require a minimum portfolio amount, are very expensive, and many times they can be deceptive as to how much they’re actually charging you. According to Business Insider, human financial and investment advisors on average charge a management fee of around 1.31%. Whereas robotic advisors like Betterment only charge a management fee of 0.15% and do not require a minimum investment. Although a self-managed brokerage style IRA accounts and robotic managed (robo-advisors) IRA’s are two of the more common ways today to invest in an IRA, there are a few other types IRA accounts that are also good options, and will suit some people better than others. Sometimes it’s also a good strategy to have more than one type of IRA account as some are safer and offer a guarantee return on your money, take Discover Banks IRA for example, which on uses high-yield certificates of deposit (CDs) in their IRA’s, which allow you to know exactly how much money you’ll make. Some people who like to play around with their money a little bit but also like to have another portion managed for them will use a combination of both a self-managed brokerage style IRA and a robotic managed IRA account. They will have one IRA account that’s self-managed, such as a OptionsHouse account, so they’re able to make some of their own investments, and have another account that automatically managed for them, like a Betterment account, which they just leave alone. For people who like having some certainty but at the same time may not want to miss out on any stock market gains, could use a combination of having one IRA account like Discover’s which offers them security and certainty, and then depending on whether they want a self-managed account or automatically managed account they would have a second account like OptionsHouse or Betterment. I’ve put together a list of the best places online to open an IRA account, whether you’re a seasoned investor or just an average Joe with little knowledge of investing but wants to begin investing for retirement and pay the lowest fees possible. For those of you who prefer security and certainty over your money but would still like to reap in high-yield returns and the tax advantages of an IRA account, don’t worry, I got you covered too. Also, for those of you who are a bit savvier when it comes to investing or just like to mix it up now and then I have a special treat for you, with Lending Club’s No Fee IRA, which I’ll explain in more detail below. Multiple types of IRA accounts. Access to resources, research, analysis, support, and education. A large variety of investment products. Special offers on new accounts and rollovers. Betterment, known as the number one robo-advisor, allows you to put your investments on autopilot. With more than $3.9 billion in assets under management, Betterment has more customers than all of the competition combined. They have a $0 account minimum, and offer the lowest management fees available, as low as 0.15% of assets managed. They offer a powerful service for your investments, with a combination of goal-based investing and industry low management fees. Betterment uses exchange traded funds, (ETF‘s), and unlike traditional brokers, Betterment clients pay no transaction fees or commissions. Read the full Betterment review. Betterment is an outstanding online investing platform that advises and helps people when making their retirement plan. They also have a huge resource of useful online tools. When you’re a Betterment client, you’ll also have access to their other amazing services like tax loss harvesting and automated portfolio rebalancing. Betterment also charges the lowest fees in the industry. For example, a person with $100,000 or more portfolio would only pay a 0.15 percent fee annually. Additionally, they are no trading fees, no rebalancing fees, and no transaction fees. By using Betterments RetireGuide, you’ll be able to optimize your retirement plan and stay on course using their interactive tools. It’s simple to use the RetireGuide, just enter in your financial information and answer a few questions. Then the RetireGuide will provide you with specific and detailed financial advice. It’ll provide you information about what you’re currently doing correctly and more importantly what you’re doing incorrectly and need improvement on. Lending Club self-directed Traditional or Roth IRA, allows you to enjoy all the tax advantages when you invest in Lending Club’s Notes. Lending Club’s Notes can give investors a monthly income, solid returns, and low volatility. You’re able to select notes from their risk adjusted notes, which have grades ranging from A through G, to create a well-diversified portfolio that’ll get you to your investment goals. Lending Club self-directed IRA’s have no account fees if you’re account has a balance of $5,000 or more. 401(k) Rollover – If you currently already have a 401(k) or 403(b) from an employer, it’s quick and easy to roll over those accounts to a Lending Club IRA. Annual Contributions – You can contribute up to $5,500 annually to an IRA, unless you’re over the age of 50, then you can contribute up to $6,500 annually to an IRA. IRA Transfer – If you already have an IRA elsewhere, you can transfer funds from another IRA to a Lending Club IRA. Lending Club has partnered up with SDIRA Services to make their Self-directed IRA very appealing to investors and give them more options. Lending Club’s Self-directed IRA gives you many more investment options and asset classes to invest in. Unlike standard or non-self-directed retirement accounts which limit the assets you’re able to invest in. OptionsHouse offers Roth IRA’s, Traditional IRA’s, Rollover IRA’s, and SEP IRA’s. 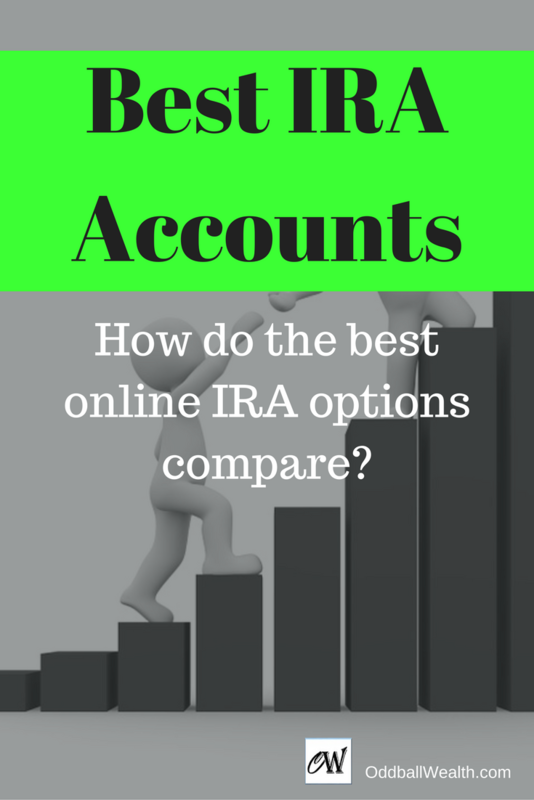 Their IRA accounts are set up and used the same way you would use and manage a regular online brokerage account, which is why OptionsHouse IRA’s are perfect for the do-it-yourself and self-managed trader. Learn More, Visit OptionsHouse Secure Website. Discover Banks CD IRA is perfect for people who like the idea of safety, guaranteed returns, and certainty that they won’t lose any money. They offer either a Roth IRA or a Traditional IRA. Discover will also let you rollover money from any other retirement accounts you have into one of theirs. You can also transfer an IRA from another bank or financial institution to Discover. You can learn more and open an IRA with Discover here.